In addition to relieving back and neck pain, chiropractic care can play an important role in achieving and maintaining overall health, at any age. Stay on the healthy path with chiropractic care. Click to enlarge the chart below and learn more about the integral role of the spine in overall health. The road to an active, healthy and happy life includes maintaining your body's natural ability to function and heal. Chiropractic is a whole person approach to health care that targets the cause of the problems, rather than just the symptoms. Regular chiropractic care, along with good nutrition, stress management, and sufficient exercise can help you become and remain an active, healthy and happy person. Chiropractic focuses on the body's ability to heal itself. The brain controls every cell, tissue, organ and function of the body. The brain sends signals down the spinal cord and out the nerves to the whole body including muscles, organs, and glands. 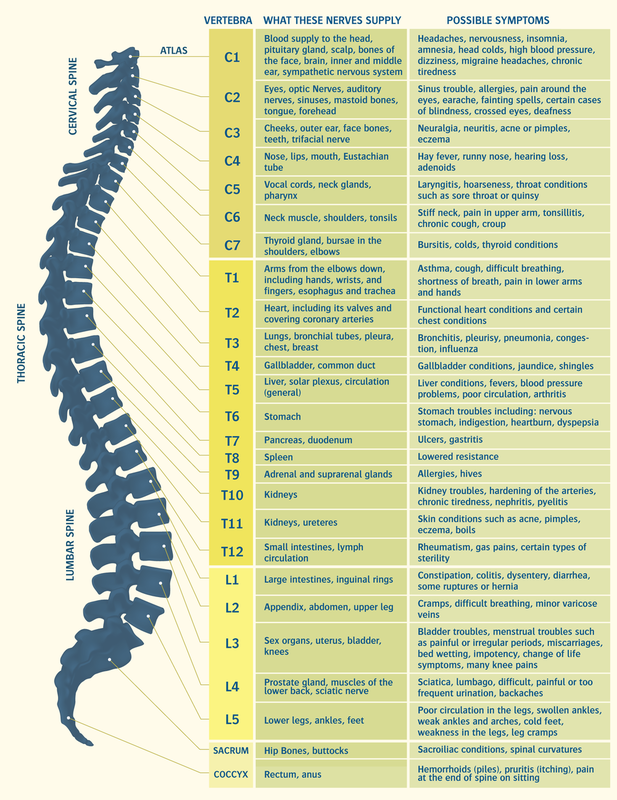 The spinal cord is protected by 24 moveable segments known as vertebrae. Misalignments of these vertebrae can cause nerve interference preventing the brain and body from communicating properly. This can result in dysfunction or dis-ease in the body which often begins prior to pain or symptoms. The goal of chiropractic care is to correct these misalignments, removing interference from the nervous system so the brain and body can communicate. This gives the body an opportunity to function properly and helps create an environment for better health. Spinal misalignments may interfere with nerve function in your body causing not only back pain, but other, sometimes serious, types of health problems. Your spine is the direct link between your brain and the rest of your body. Sometimes, the fact that there is nerve interference becomes obvious. We experience pain, soreness, irregularity, weakness, digestive disturbances or other health imbalances. These are symptoms of the body's dis-ease. They are NOT problems in themselves. They are outward alarms that a part of our internal system isn't working right. Ignoring these symptoms, or silencing them with pills, doesn't do anything to help the real problem. Unless we get to the root of the problem—the nerve interference—the affected organ will continue to function improperly and its health will decline. If the affected nerve happens to be carrying a message to the liver, the function of the liver can be altered. If the nerve is taking instructions from the brain to the heart, that organ's function may be compromised. The fact is, the health of every part of the body depends on the proper flow of signals from the brain through the nervous system. If that normal flow is interrupted or interfered with, some part of the body will not be able to function at peak performance. Chiropractors locate misalignments in the vertebrae. They use spinal adjustments to make corrections. When the joints (vertabrae) are allowed to go back to their proper positions, the nerves can resume transmitting signals from the brain more freely.